Grizzly bears are common inhabitants of the Great Bear Rainforest. At the time of year I was there, late June, their principal diet is sedge grass, which grows abundantly along the banks of the streams. The skies were dramatically overcast. Rain, which had threatened for some time, had just begun to fall. The protected waters surrounding the islands of the rain forest on British Columbia’s west coast were calm; our small aluminum boat rocked gently as we made our way slowly about 50 yards out from the shoreline of one of those islands. This is a pristine world, still largely untouched by the hand of man. This is a place they call “The Great Bear Rainforest.” Ancient western red cedar, Sitka spruce trees and dense green undergrowth reach right to the water, curtailed by an almost perfect horizontal line, which indicates the high tide mark. Then came the call, “There’s a spirit bear.” Charlie, elder of the Kitasoo/Xai’xais First Nation and the skipper of the boat, had made the sighting. My quest to see and photograph this beautiful creature had its origins, like many other of my photographic adventures, in an email, which came to me in early April 2017 from Chris Steppig of Summit Workshops. The subject of the email, “Great Bear Rainforest, British Columbia,” caught my eye, and as I read “… an opportunity right up your alley,” I was committed before I had even finished reading the message. I have a long-standing interest in apex predators and bears in particular. Photographing grizzly bears in Wyoming in 2013 and 2016 provided me with some cherished photographic moments. I was keen to continue my quest to photograph other bear species, and to understand the conservation issues surrounding them and to see how those issues related to many of the endangered fauna species in Australia, my home. To get the best results from this expedition, I knew I needed to be prepared. Just turning up and hoping for the best was not an option. Preparation involves research; I needed to understand the history and geography of the region as well as the habits and behaviors of the animals I was likely to encounter. I also needed to understand the photographic limitations that I could be facing. Low light, wet weather, moving subjects and possibly shooting from an unstable platform would all impact on my ability to get sharp, clear, well-composed photos. In the tidal zone, a part of the pristine wilderness that makes up the Great Bear Rainforest. Time for a camera upgrade. I knew I would often be shooting at high shutter speeds to freeze moving wildlife, so high ISO performance would be important to give me shutter speeds of 1/1600 sec. or faster. A high-speed continuous shutter burst rate would also be advantageous to capture birds in flight and other faster-moving animals. This would also become very helpful with composition when shooting with a longer lens from a small boat as holding the camera still would be near impossible. There is always compromise when selecting camera gear, but my choice of a Canon EOS 7D Mark II, with its 10 frames per second shutter burst and great high ISO capability, paired with my Canon EF 400mm f/5.6L USM lens, served me well. There are no roads into the Great Bear Rainforest, located approximately 350 miles north of Vancouver. Access is by water, floatplane or helicopter. Our journey began on a clear-skied summer morning as we assembled at Vancouver’s South Terminal ready to board our twin engine Pacific Coastal Airlines plane, which took us on a 90-minute scenic flight over snow-capped ranges and coastal islands to the small village of Bella Bella, on Campbell Island. A couple of mini buses transferred our party of 10 photographers from the modest airport on the edge of the village to the dock where our small but functional water transport awaited to ferry us to our final destination. Just under two hours later, after bouncing across stretches of open ocean and gliding smoothly along more protected waterways and inlets, we arrived at the dock of the Spirit Bear Lodge, our home for the next five days in the remote but delightful village of Klemtu. Snowmelt cascades through the rainforest into the tidal waterways of the Great Bear Rainforest. The Great Bear Rainforest is estimated to be approximately 12,000 square miles and has been described as one of the largest remaining unspoiled temperate rain forests in the world. Standing on the Spirit Bear Lodge dock, it is impossible not to be taken by the silence, save only for the whistle of a passing bald eagle—a common sight around the village—or the distinctive screech of a raven. The next four days would see our explorations beginning just after breakfast, heading out in our trusty 12-seater boat before scrambling aboard six-person rubber inflatables, allowing us to probe much further up shallow glacier-fed streams with their verdant sedge grass and lupine-covered banks to photograph and bask in the tranquility of the surroundings. The Great Bear Rainforest is home to a vast array of wildlife, including brown bears, black bears, wolves, mink and other land mammals, birds and marine animals like orcas, humpbacked whales, seals, sea lions, sea otters, dolphins and many more. It is a large, pristine wilderness. We learned of the importance of the salmon as they make their way determinedly up to their freshwater spawning grounds, not only as a food source for bears and wolves but also eagles and ravens and many other scavengers who devour the fish carcasses. Researchers have discovered traces of salmon many miles away from the water, remains of the decaying fish breaking down to become the fertilizer on which so much of the forest depends. Declining salmon populations, brought about by many factors like climate change, sedimentation of spawning grounds and commercial fishing, has the potential to impact large chunks of this fragile ecosystem. The Kermode bear (Ursus americanus kermodei), or spirit bear, has its scientific origins as a subspecies of the black bear (Ursus americanus). A black bear with white or creamy colored fur, it is has no relationship to a polar bear and is not an albino. It shares the dark brown eyes and dark nose of its black bear cousins. A small percentage of black bears in the Great Bear Rainforest (estimates are in the order of 20 percent) carry a recessive gene. When both parents carry this recessive gene, the offspring will have white fur. I think I rather prefer a more spiritual explanation of the origins of the spirit bear, passed down by the Kitasoo/Xai’xais people of the region. It is said that at the end of the “Ice Age,” the Creator (the Raven) chose to leave a small number of white bears as a reminder that the region was once covered in snow and ice, and that it needs to be cared for and preserved. 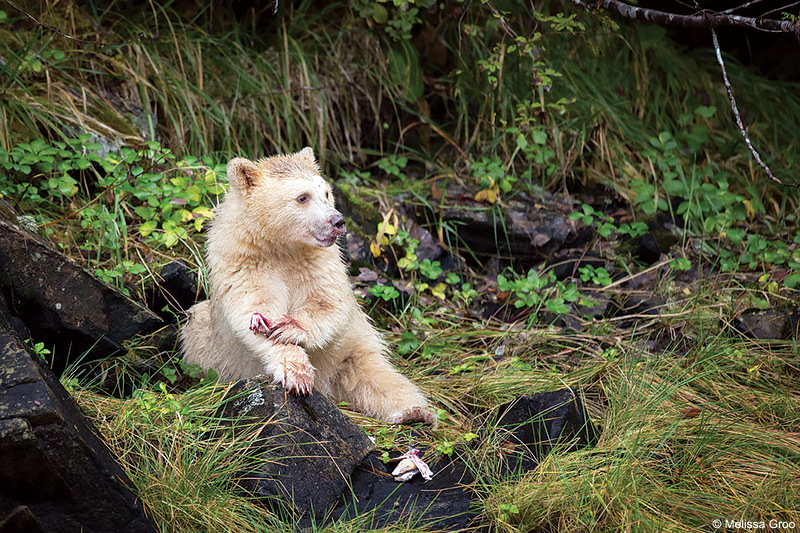 Regardless of its origins, the spirit bear is extremely rare and lives exclusively in these island rainforests. It is estimated that as few as 60 to 100 spirit bears exist today. While it is illegal to hunt the white bear, the spirit bear population is nevertheless under threat, partly due to the misguided notion by some hunters that killing the dark-coated bear will preserve the white-coated animals. Hunting of black and grizzly bears continues in the Great Bear Rainforest, although it has been announced that “trophy hunting” of grizzly bears will be banned at the end of the 2017 hunting season. “You have to ask yourself why you care.” In the still calm of a clear twilight evening at the Spirit Bear Lodge, Mike Forsberg offered that suggestion to me to answer the question, “How can we make a difference?” It is so easy to come up with a glib, superficial answer to that question. “Oh, I want the next generation to see what I saw. I want to give voice to creatures who can’t speak for themselves.” Yes, I want those things, but is that enough? I do care, fervently. My passion emanates from a deep spiritual connection to nature and wild places and a desire to capture images of these special places to help others engage in a subject that is becoming remote from our increasingly urbanized society. This bald eagle, perched on a dry limb hanging out over the water, kept a keen eye on the receding tide for a meal. The Kitasoo/Xai’xais people, spiritual custodians of this land, embrace the philosophies of tread lightly, take only what you need and leave the rest. Working with scientific researchers, they have implemented a non-invasive method of studying animal behavior. Bears in the Great Bear Rainforest are not tagged or interfered with in any way. Their habits, diet and movement are studied through careful observation and analysis of hair and other samples collected from their territory. “There’s a spirit bear.” Charlie’s call had come just before midday on our last day. We were not supposed to see a spirit bear. It was too early in the season, they wouldn’t be down close to the water for another month or six weeks, the salmon are not running yet, they said. I had a strong feeling to the contrary. We had to at least go and see where she might be, so our guide agreed to take us. There she was, grazing on sedge grass at first, then moving slowly but purposefully along the shoreline, allowing us a few precious moments to be in her space before she faded into the shadows of the forest. We had just witnessed the rarest bear species and one of the rarest mammals on earth. A gift indeed. A special gift. This spirit bear made a brief appearance along the shoreline before fading back into the forest. It is a sad fact, and a sign of the precarious times in which the spirit bear lives, that we were asked not to reveal the exact location of our sighting in any of our social media posts and to disable any GPS references from the metadata attached to the photo files we posted. Apparently, there are people keen to grab this information and pass it on to illegal hunters. Photographing in these conditions—a moving subject, from a moving platform (a boat) in gloomy low light—was challenging. Coming away with an image of this beautiful, rare creature in her world left me with a spiritual connection to this place that I will never forget. David Mackenzie is a nature and conservation photographer based in South East Queensland, Australia. Tips and insights for telling the stories of the animal kingdom through your photography. Read now. The post Great Bear Rainforest appeared first on Outdoor Photographer.